Every once in awhile, we get a glimpse of something that we know God meant for us to see. It will remind us of what our relationship with Him is to be, and that He is to be the foundation of our lives. That's what this photo did for me. 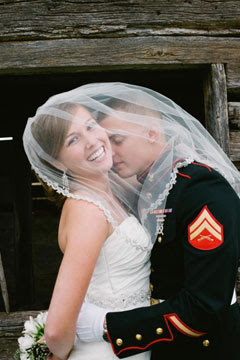 This quiet moment between bride and groom before their August 2012 wedding went viral last year, and is now seeing a resurgence across the digital world. Why do you think that is? Without even knowing the back-story, it tells me so much. The bride's hand is on her stomach, indicating possible nervousness, excitement, butterflies before beginning her life with the young man who firmly holds her hand. Heads bowed, they are obviously in prayer; most likely for their future together as man and wife, and for their commitment to each other and God. His military uniform tells me that duty and loyalty and purpose are among his character traits. He also shows that he has a commanding hold of her hand, revealing his desire to protect and guide her. Finally, the fact that they refrain from seeing each other before the ceremony, implies the importance that honor and respect and virtue hold for them. Now, here are the more intimate details: Bre Curtas, the bride, and her bridesmaids were fussing over last-minute details in her dressing room when Curtas’ future mother-in-law walked in with a message. “Sweetheart, your groom has called for you,” she said. At first, Curtas didn’t want to go — she still had so much to do. She was worried about her hair, her dress, her makeup. The bride's heart fluttered as her mother-in-law pulled her to a corner where her groom, Josh, was waiting — what could he want? When she sat down, the nervous bride slid back into the chair so that Josh couldn’t see her dress. She managed to squeak out, “Hi sweetie! We’re getting married today!” “I know, baby, and I want to pray with you before we do,” her groom, Josh, replied. It wasn't an easy road for Bre and Josh to arrive at this private moment. Their relationship had had its ups and downs, and Bre had even broken up with Josh for a time. After accepting a date for coffee, Bre realized "there wasn’t a day that he didn’t pray that the Lord would bring me back, and I knew I'd never find that again." Lots of prayer re-established their relationship and they made the unpopular and rare decision to wait to consummate their marriage until their wedding night. It was a tough choice to make, one that the couple struggled with for months. And she understands that "it’s not for everybody. But there is a blessing and a benefit to it.” Only 14% of brides today can relate to her decision. That says a lot about our culture, doesn't it? But the couple's past difficulties were of no significance, as Josh took hold of her hand. And I think it's more than that. I think people recognize a sense of purity that is missing from our modern way of life. In this simple snapshot of one of the most important moments in anyone's life, we are witnessing a moment that speaks to us of innocence and reverence; both of which are lacking in today's world. You might think this is nothing more than a sentimental, mushy post. But I have to tell you that this photo represents something so sacred; it sparks a renewed hope for a revival of such sanctified values. There's a reason that this photo garners 100,000 views each time it is posted... at our deepest spiritual level, we are hungry for such expressions of humble surrender. Thank you for sharing, Bre and Josh. Keep reminding us who should come first in our lives. 1 John 4:16 "So we have come to know and to believe the love that God has for us. God is love, and whoever abides in love abides in God, and God abides in him."